Falling in love is lavishing, claiming the heart of your soul mate feels magical, choosing Samfi Gardens with the view of the Majestic Pitons in the background would make your moment mystical. 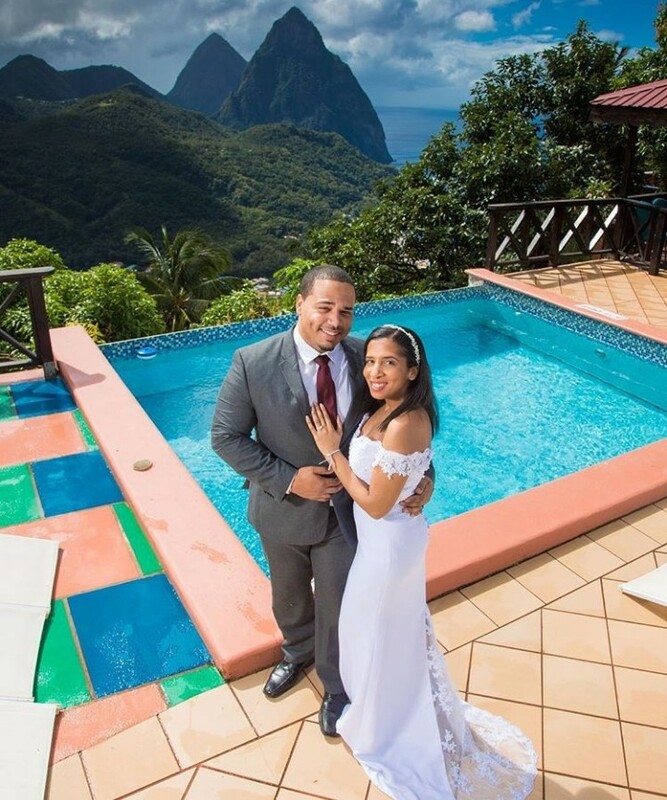 Welcome to beautiful St. Lucia, thank you for choosing Samfi Gardens for your romantic destination wedding. Our resort wedding specialist Marcus will be happy to assist with any question in regards to your special day. Here are a few packages offered at Samfi Gardens. All legal fees and marriage license application process. Marriage certificate - day after ceremony. Transportation cost for marriage officer. Two pedestals decorated with tropical flowers. Tropical bridal bouquet and boutonniere. Recorded music of your choice at the ceremony. A bottle sparkling wine to toast. Single tier sponged cake (Vanilla, Chocolate or Marble). All the expert services of your wedding specialist. Marriage certificate day after ceremony. Two-tier St. Lucian wedding fruit cake. St. Lucian hand crafted wedding souvenir. • Transportation cost for marriage officer. • Two pedestals decorated with tropical flowers. • Tropical bridal bouquet and boutonniere. • Bottle of sparkling wine for toasting. • All the expert services of your wedding specialist.